Clyde boss Jim Chapman has continued his rebuilding job with the addition of keeper Blair Currie and midfielder Darren Miller. Miller had a spell on loan at Clyde from Queen’s Park last season, making seven appearances, before leaving Queen’s in January. He then joined crack Motherwell amateur side Colville Park, and helped them to lift the Scottish Amateur Cup for the second successive season. The 24-year-old, who has also had spells with Albion Rovers, Dumbarton and Queen’s Park, has signed a one-year deal with Clyde. Chapman told the Clyde website: “Darren knows the club and he knows what will be expected of him this season. Currie (23) played under Chapman at Annan, having moved there from Hamilton Accies after beginning his career with Rangers. In two years at Galabank he established himself as Annan’s first choice keeper and was named in the SPFL League 2 Team of the Year for the 2016-17. Currie has also signed a one-year deal. Clyde have arranged three pre-season friendlies with League 1 sides as they build up to their Betfred opener against Annan on Saturday, July 15. 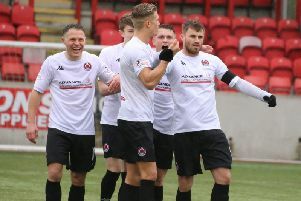 They will face Albion Rovers at Cliftonhill on Saturday, July 1 (kick-off 3pm), before taking on Airdrie and Raith Rovers - both at Broadwood - on Tuesday, July 4 (7.30pm), and Saturday, July 8 (12.30pm), respectively.